Make some war, get some free DLC. Want more Total War? Who doesn't?! 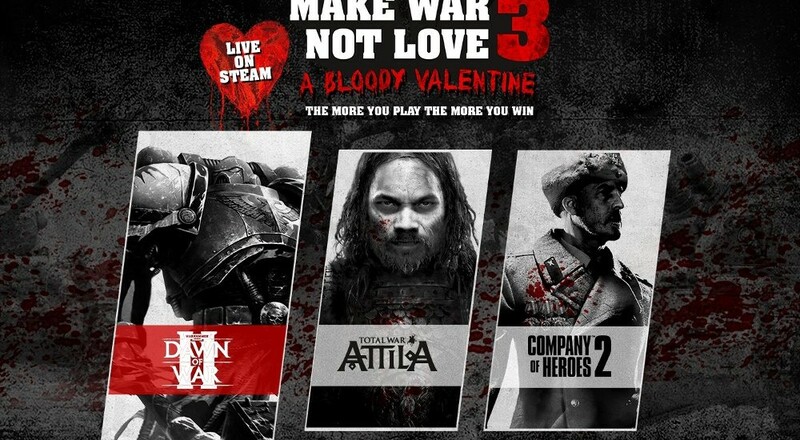 Sega, Relic and Creative Assembly have teamed up for a little Valentine's Day game giveaway called Make War, Not Love. The highlight of the celebration includes a player-driven competition between Total War: Attila, Company of Heroes 2, and Dawn of War II. Three PC RTS games enter, and the one that gets the most plays between now and February 20 wins. Wins what? Free DLC! All you have to do is rally your fellow fans together and log tons of hours on any of the three games listed above. The game with the most hours after Feb 20 gets the freebie, plain and simple. All titles have some co-op play, but we're a touch partial to Dawn of War 2, as you can see in our Dawn of War 2 Co-Op Review. The Company of Heroes 2 DLC up for freedom is the set of Advanced Emplacement Regiment and Mobile Assault Regiment add-ons, due Feb 25. Dawn of War 2 is scheduled to receive Tau Commander in the near future, and Total War: Attila gets the Slavic Nations Culture Pack, also due Feb 25. The winning game gets its DLC for free, while the others have to pay, like the losers that they are! As an extra special bonus, all three games are available for 75% off on Steam through February 20. The DLC in question is also on sale, just in case you don't have faith in your team's ability to log hours. Page created in 0.3508 seconds.